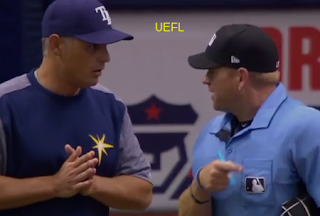 HP Umpire Mike Muchlinski ejected Rays CF Kevin Kiermaier (strike three call) in the bottom of the 7th inning of the Blue Jays-Rays game. With one out and one on (R1), Kiermaier took a 3-2 fastball from Blue Jays pitcher Aaron Loup for a called third strike. Replays indicate the pitch was located over the heart of home plate and below the hollow of the knee (px -.076, pz 1.239 [sz_bot 1.565]), the call was incorrect. At the time of the ejection, the Rays were leading, 5-2. The Rays ultimately won the contest, 7-2. This is Mike Muchlinski (76)'s first ejection of the 2017 MLB regular season. Mike Muchlinski now has -4 points in the UEFL Standings (-2 Previous + 2 MLB - 4 Incorrect Call = -4). Crew Chief Mike Winters now has 4 points in Crew Division (4 Previous + 0 Incorrect Call = 4). This is the third ejection report of 2017. This is the 2nd player ejection of 2017. Prior to ejection, Kiermaier was 3-4 (SO) in the contest. This is Tampa Bay's 1st ejection of 2017, 1st in the AL East (TB 1; BAL, BOS, NYY, TOR 0). This is Kevin Kiermaier's first career MLB ejection. This is Mike Muchlinski's first ejection since June 12, 2016 (Justin Turner; QOC = Y [Balls/Strikes]). Wrap: Toronto Blue Jays vs. Tampa Bay Rays, 4/9/17 | Video via "Read More"